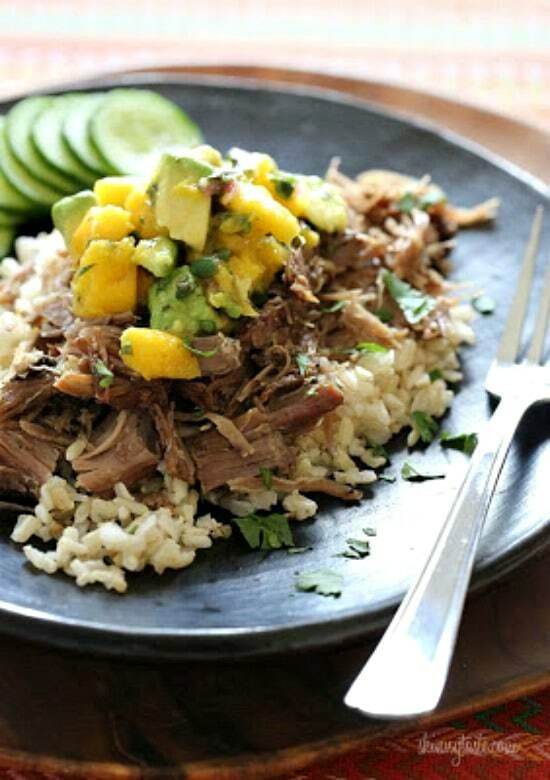 For this Slow Cooked Jerk Pork with Caribbean Salsa marinated Pork cooks all day until it’s falling-apart tender and then it’s served over rice with a salsa of fresh mango, avocado, and cilantro. Doesn’t that sound like a tasty dinner idea? For Friday Favorites we spotlight past recipes that you may have missed, and this Slow Cooked Jerk Pork with Caribbean Salsa from Skinnytaste sounds like a delicious family-friendly slow cooker meal. There’s a lot to love about this recipe, and for some of you who need things that can cook all day while you’re at work the 9-hour cooking time on low might be enough to get you to try it. But even without that nice bonus, I love the sound of this pork that’s marinated overnight in citrus, garlic, and jerk seasoning, cooked all day until it’s falling-apart tender, and then served over rice with a fresh-sounding Caribbean salsa. Gina recommends a jerk rub that she likes, but if you don’t want to buy a special ingredient for one dish, Google a recipe and make your own. For the Carribean Salsa: Avocado, mangos, red onion, cilantro, lime juice, salt and pepper. Get the complete recipe for Slow Cooked Jerk Pork with Caribbean Salsa from Skinnytaste. I'm not a pork eater, but this surely does look delicious. Lydia, I bet this would be delicious with chicken as well!